Cling Stamp from Impression Obsession featuring the humorous sentiment "Seriously ... stop expecting normal from me ... it's never going to happen." 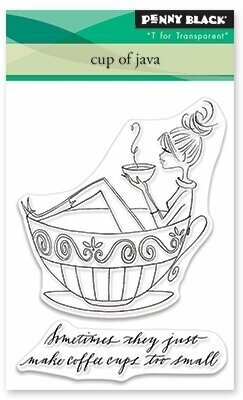 From Art Impressions, this set of unmounted stamps features a woman with the saying "If it zips, it fits". Clear Stamp Set. Woman in towels standing on a scale, woman laying on a massage table, and sentiments "Well the towels must add an extra 40 lbs!" "To be treated like the queen... is that too much to ask?" "A few more pounds and I'll be thin enough to go to the gym!" "Life is just one interruption after another!" "It's your birthday, pamper yourself" "Glamorous" "Forget loosing 20 lbs... How do I lose 20 years?!" Unmounted stamp featuring the sentiment "Happy birthday you're gonna need these" with sunglasses icon. 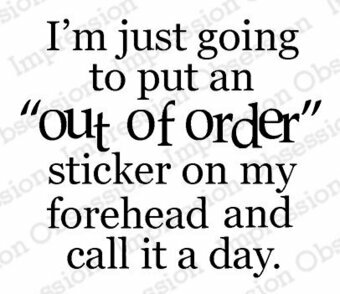 Cling Stamp from Impression Obsession featuring the humorous sentiment "sometimes I pretend to be normal. But it get's boring. So I go back to being me." Cling Stamp from Impression Obsession featuring the humorous sentiment "You only live once, you might as well be amusing". From Art Impressions, this set of unmounted stamps features a woman standing on a scale saying "I few more pounds and I'll be thin enough to get to the gym". Part of the AI People 2014 release from Art Impressions, this set of unmounted stamps includes a woman with the humorous saying "My dentist says I need a crown... well, duh". "Smile, its a cheap face lift!" Art Impressions unmounted rubber stamp featuring Celeste on a couch, along with the humorous saying "At our age we're going to need glasses... lots and lots of them". 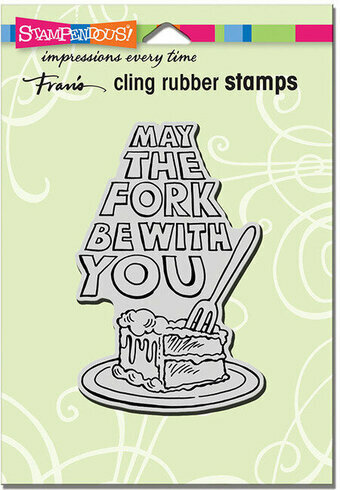 Cling Stamp from Impression Obsession featuring the humorous sentiment "Keep Calm and Have a Cupcake". 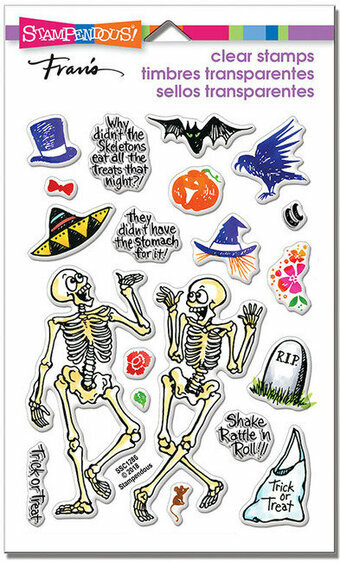 Halloween themed Cling Stamp from Impression Obsession featuring the humorous sentiment "if you got it, haunt it". Wish your cat-loving friends well with this hilarious clear stamp set! Featuring a cat with cast and crutches, cat with a cone, cat in overalls on hot water bottle and pillow, kitten with balloon and flower, sick kitty with a mouse toy and bandages, cup of tea, box of tissue, and sentiments "I'm a lamp" "Ouch" "'rankly, I'm 'Over-all' this sickness business" "Heard theres been a cat-astrophy get better soon!" "Wishing your furry friend a speedy recovery" "Meowch" "I'm gonna knead you to get better meow." "Stay paws-itive". Set of 15 clear stamps. Cling Stamp from Impression Obsession featuring the humorous sentiment "Don't worry if you're making waves. The moon does it all the time." 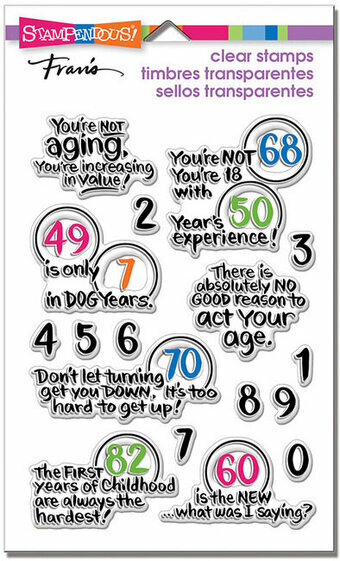 "Old age...mature-wise-composed HA! Not if we can help it!" 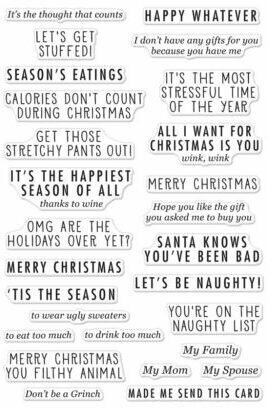 All you want for Christmas is... this mini stamp set! And a unicorn, of course. Color the unicorn's hair blue for winter, fun rainbow colors, or any other way you wish! You can also stamp a little heart or star on the unicorn for a fun detail. Approximate stamp sizes: [unicorn] 1 2/3" x 1 1/2". 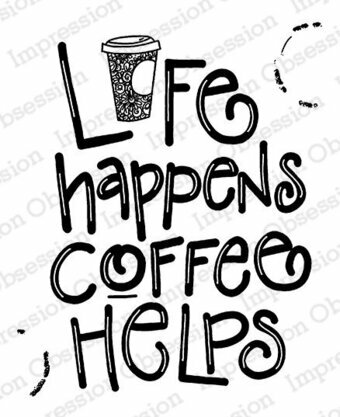 Coffee themed Impression Obsession cling stamp featuring the humorous sentiment "Life happens, coffee helps". "Bird Brains" collection Art Impressions stamp featuring the sentiment "Just between us chicks, you've gotta be born with curves like these!" "Happy Birthday to the "Lawn Ranger"!" 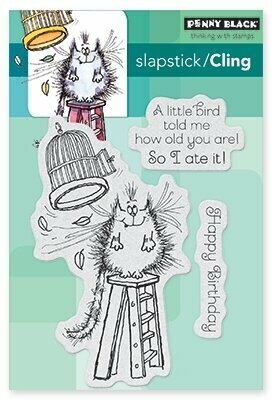 Stamp Dimensions: 1 1/2" W X 1" H.
This 10 piece clear stamp set is packed with funny images and hilarious sentiments! A goat on top of a hat eating a birthday cake, a jumping goat with a bell around its neck, a group of staring goats, and sentiments: "Another birthday? You're kidding me!" "I got you a cake, but I ate it." "Chews to party!" "You've goat this!" 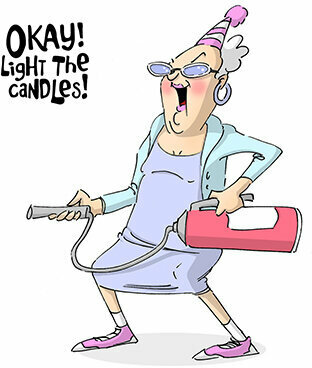 "Herd you were another year older, it's not that baaaaad!" "Old goat" "Welcome to the Old Goats Club!" From Art Impressions, this set of unmounted stamps features a woman exercising wile saying "Am I skinny yet?". 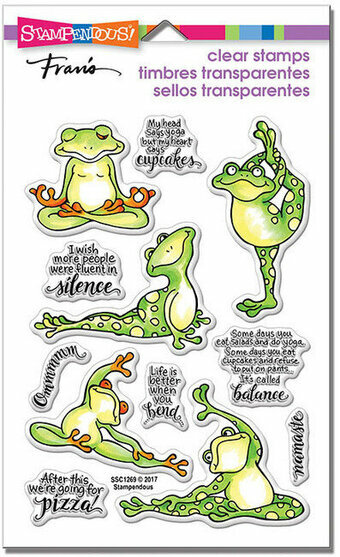 This 11 piece clear stamp set is packed with funny images and hilarious sentiments! A cow with balloons and a tutu, sitting cow with an "I'm bossy" mug, two dancing cows in tutus, and sentiments: "Happy birthday to mooo!" "Simply bovine!" "Udderly moovelous!" "Something in the way we moooove!" "Holy cow you're old!" "Party 'til the cows come home!" "We've got the mooooves!" "Have an udderly fantastic birthday!" "We divas have to stick together!" "Can I borrow some Weight Watchers points?" Part of the Girlfriends Collection from Art Impressions. 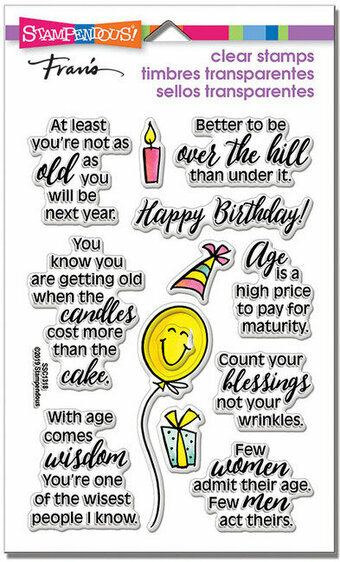 Birthday themed stamp featuring the humorous sentiment "Another year, another wrinkle". "Wine gets better with age... We get better with wine!" Part of the Girlfriends Collection from Art Impressions.